If you’ve ever felt like your dealership is chasing the clock but still not producing the right results, then it could be due to a mismanagement of time. Efficient time management means your team is spending working hours on things that matter and helping drive more revenue into your dealership. Time management is one of the best investments you can make into your business to ensure your dealership stays on track to reach its goals. The Quickride team understands this which is why our app easily solves common issues that waste productivity. Our partners save on average 1.5 hours per day just by using Quickride. Here’s five ways the Quickride app can help. The Quickride Driver app is built for efficiency. Drivers are assigned rides directly into the app which are then ordered to produce the fastest arrival times. This means drivers are automatically directed to their pick-up/drop-off locations without ever having to communicate with the service department. The Driver app’s live mapping system also ensures drivers take the best route possible. Drivers can easily navigate and avoid traffic delays ensuring customers have the smoothest trip possible. Quickride transforms dealership communication breakdowns by eliminating the middle man (the service manager) and allowing drivers and riders to communicate with each other directly through the respective apps. Riders never miss a shuttle and service managers have peace of mind knowing shuttles will stay on time. 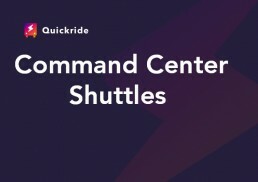 The Command Center allows service managers to track and manage shuttles from one, centralized location. Your team can quickly make updates within the platform and get back to managing the service department. With smoother systems in place, both customers and service teams are left happier. Dealerships can focus more time on selling services and less time stressing out about managing shuttle services. Quickride partners are saving time and money by using our app. Schedule a demo today to discover how we can help your dealership do the same.